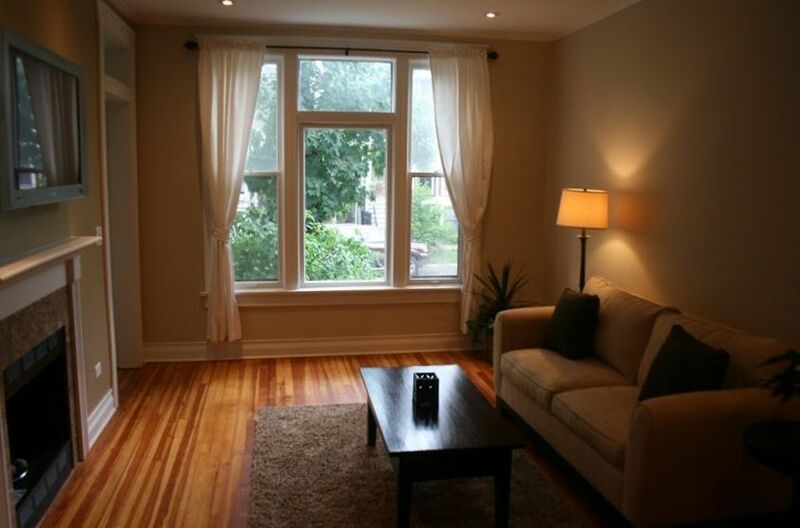 Newly remodeled 3 bedroom 2 bath fully furnished apartment in the heart of Roscoe Village. Whether you’re planning a weekend excursion, business trip or need a comfortable place to stay for family or friends, consider our newly rehabbed Guest house on Hoyne St.
Trendy Roscoe Village offers boutique shopping and a variety of restaurants and bars. Approx .7 miles from Addison “El” stop which will take you downtown or catch a bus half block away that will take you to the Belmont 'El' stop. We do have another 3 bedroom 1 bath unit in the same building that could sleep an additional 8 guests. The property can accommodate up to 16 total guests. We have another property next door that can accommodate 22 people. We have another property 1.5 blocks north that can accommodate an additional 14 guests. Hit the tab to see all my properties. My family stayed here during Memorial Day weekend and enjoyed the place very much. So when we decided to gather in Chicago for Thanksgiving, this was the logical place to stay. Very nice furnishings, good climate control, plenty of kitchenware, helpful guestbook, easy access to the shops and restaurants on Roscoe and to public transportation. It's likely we'll be back here for the next family gathering. Overall our stay was amazing. The only reason I didn't give it the full 5 star was due to the fact the when the neighbors upstairs are up very early in the morning at 5 and the floors would creek and you can hear everything from upstairs people going up and down and in and out of the place! Other than that everything else was great! My younger daughter lives in Roscoe Village, so this apartment made a very nice place to stay for me and my other daughter and her family for the Memorial Day Weekend. The apartment is nicely furnished and has just about everything we needed: adequate number of towels, cookware and tableware, closet space, comfy bedding. The backyard was great for the childrens' playing and for the Memorial Day cookout on the grill. We had easy access to public transportation and lots of interesting neighborhood restaurants and shops nearby. The booklet listing cable channels, recommended restaurants and attractions was very helpful. I'll definitely consider staying here the next time we get together in Chicago. We loved the house and the location. Great neighborhood, beautiful home, luxurious bathrooms, fabulous backyard, and good parking. We loved the experience and would definitely recommend it to others. We stayed here as part of a guys hockey three night trip. Everything you could ask for and more. Everything is updated and first class. We did not rent a car and did not need one. The 77X bus line goes up and down Belmont Ave and lets off at the corner of Hoyne. (1.5 blocks from house). Using the bus you can connect to the CTA blue line (airport) or the Brown/Red/Purple lines which take you to the rest of Chicago. Bus will also stops in front of new Whole Foods if you want to stock up and into Wrigleyville. The combination of bus and CTA will get you to the Loop in about 30 minutes if you plan well. If you just plan to hang in the neighborhood there are plenty of food and drink options as well. We did a small pub crawl one night in Roscoe Village and found plenty of places to go. Note: if you do rent a car the bus will take you close to an Enterprise Rental car and street parking is plentiful around house. Our unit had three comfortable bedrooms, a fully equipped kitchen (we made breakfast each morning ) a nice size kitchen table and a living room that could hold five - six comfortably. There is also a back deck with grill and table for dining. Again, everything was modern and up to date. I would definitely rent this property again in the future. Thank you Bob! We look forward to having you stay with us again in the future. Me and my family stayed at the property for 5 days. This is very beautiful, clean, a warm house with all facilities you need and in a perfect and beautiful position. I'm sure recommend this property and you're going to be delighted! In Heart of Roscoe Village, 10 Min Cab Ride From Downtown. We are in a great family neighborhood close to downtown. We have our own boutique shopping, outdoor cafes, excellent restaurants and bars. All weekends have a 3, 4, 5 or 6 night minimum. Please as about your specific dates. Also, please ask us about our winter special in January & February We do allow 1-2 nights stays Monday-Thursday with a cleaning fee. Restrictions do get lifted and gaps will be filled so please ask about your specific dates.